Hungary’s IPRI score increased by 0.105 to 6.097 placing it 6th in the Central Eastern Europe and Central Asia region and 46th in the world. Hungary is classified by the IMF as part of the Emerging and Developing Europe group and by the World Bank as High income country. Hungary’s Legal and Political Subindex increased by 0.065 to 5.351 with scores of 3.592 in Judicial Independence, 6.021 in Rule of Law, 6.628 in Political Stability, and 5.162 in Control of Corruption. Hungary’s Physical Property Rights Subindex increased by 0.070 to 6.248 with scores of 3.840 in perception of Property Rights Protection, 9.431 in Registering Property, and 5.474 in Ease of Access to Loans. 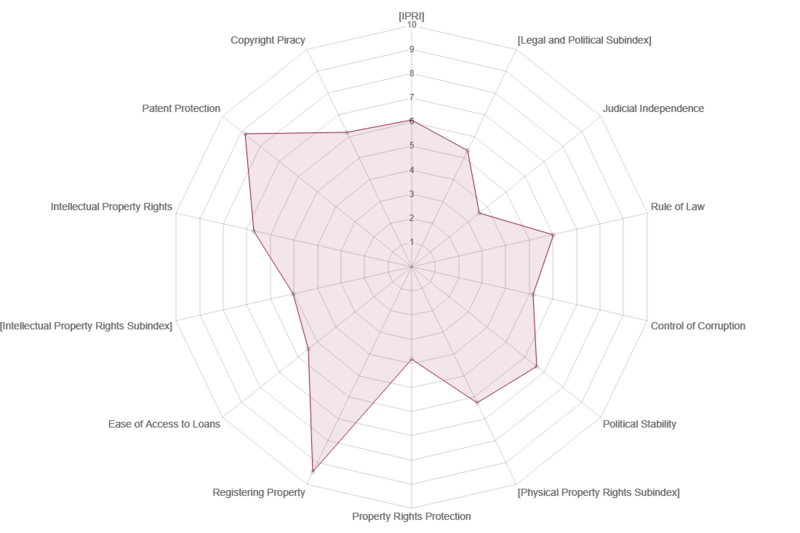 Hungary’s Intellectual Property Rights Subindex increased by 0.182 to 6.693 with scores of 5.047 in perception of Intellectual Property Protection, 8.833 in Patent Protection, and 6.2 in Copyright Protection.